When studying Crohn’s disease – an inflammatory disorder of the gastrointestinal tract, a challenge is separating out potential causes from the flood of systemic inflammation inherent in the condition. 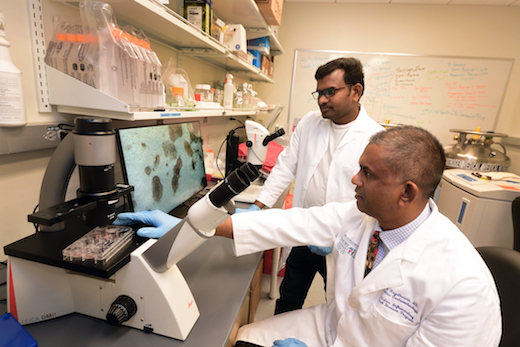 Researchers led by Subra Kugathasan, MD recently published an analysis that digs under signs of inflammation, in an effort to assess possible causes. 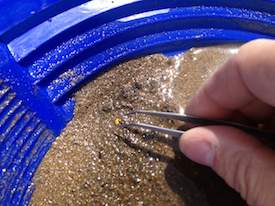 Graduate student Hari Somineni, in Kugathasan’s lab, teamed up with Emory and Georgia Tech geneticists for a sophisticated approach that may have found some gold nuggets in the inflammatory gravel. The results were published in the journal Gastroenterology. In studying Crohn’s disease, Emory + Georgia Tech researchers may have found some gold nuggets in the inflammatory gravel. The group looked at DNA methylation in blood samples from pediatric patients with Crohn’s disease, both at diagnosis and after treatment and follow-up. The information came from blood samples from 164 children with Crohn’s disease and 74 controls, as part of the RISK study, which is supported by the Crohn’s & Colitis Foundation and Kugathasan leads. “Our study emphasized how important it is to do longitudinal profiling – to look at the patients before and after treatment, rather than just taking a cross section,” Somineni says. MSCs: what’s in a name? At a recent symposium of cellular therapies held by the Department of Pediatrics, we noticed something. 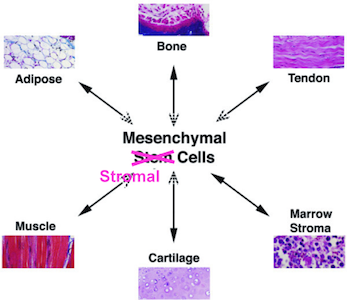 Scientists do not have consistent language to talk about a type of cells called “mesenchymal stem cells” or “mesenchymal stromal cells.” Within the same symposium, some researchers used the first term, and others used the second. Guest speaker Joanne Kurtzberg from Duke discussed the potential use of MSCs to treat autism spectrum disorder, cerebral palsy, and hypoxic-ischemic encephalopathy. 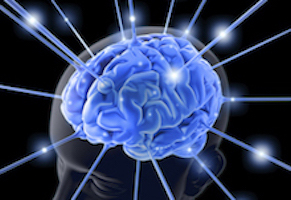 Exciting stuff, although the outcomes of the clinical studies underway are still uncertain. In these studies, the mesenchymal stromal cells (the language Kurtzberg used) are derived from umbilical cord blood, not adult tissues. Nomenclature matters, because a recent editorial in Nature calls for the term “stem cell” not to be used for mesenchymal (whatever) cells. They are often isolated from bone marrow or fat. 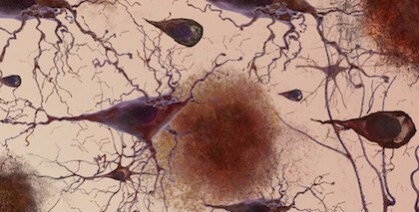 MSCs are thought have the potential to become cells such as fibroblasts, cartilage, bone and fat. But most of their therapeutic effects appear to come from the growth factors and RNA-containing exosomes they secrete, rather than their ability to directly replace cells in damaged tissues. The Nature editorial argues that “wildly varying reports have helped MSCs to acquire a near-magical, all-things-to-all-people quality in the media and in the public mind,” and calls for better characterization of the cells and more rigor in clinical studies. At Emory, gastroenterologist Subra Kugathasan talked about his experience with MSCs in inflammatory bowel diseases. Hematologist Edwin Horwitz discussed his past work with MSCs on osteogenesis imperfecta. And Georgia Tech-based biomedical engineer Krishnendu Roy pointed out the need to reduce costs and scale up, especially if MSCs start to be used at a higher volume. Several of the speakers were supported by the Marcus Foundation, which has a long-established interest in autism, stroke, cerebral palsy and other neurological conditions. What part of the intestine is problematic matters more than inflammatory bowel disease subtype (Crohn’s disease vs ulcerative colitis), when it comes to genetic activity signatures in pediatric IBD. That’s the takeaway message for a recent paper in Cellular and Molecular Gastroenterology and Hepatology (the PDF is open access) from gastroenterologist Subra Kugathasan and colleagues. His team has been studying risk factors in pediatric IBD that could predict whether a child will experience complications requiring surgery. Kugathasan is professor of pediatrics and human genetics at Emory University School of Medicine and scientific director of the pediatric IBD program at Children’s Healthcare of Atlanta. He is also director of the Children’s Center for Transplantation and Immune-mediated Disorders. Research associate Suresh Venkateswaran, PhD, is the first author on the CMGH paper. These findings have implications for other study designs involving molecular profiling of IBD patients. The authors believe the findings will be important for future design of locally acting drugs. Last year, pediatric gastroenterologist Subra Kugathasan gave an “old fashioned” grand rounds talk at Children’s Healthcare of Atlanta’s Egleston hospital, describing a family’s struggle with a multifaceted problem of autoimmunity. Now the Journal of Pediatric Gastroenterology and Nutrition paper, on how the genetic alteration underlying the family’s struggles was identified, is published. Kugathasan reports that the young man at the center of the paper is scheduled for allogeneic bone marrow transplant in the United States (but not in Atlanta) in the next couple months. The list of troubles the members of the family had to deal with is long: gastrointestinal issues and food allergies, skin irritation, bacterial + yeast infections, and arthritis. The mother and her brother were affected to some degree, as well as all three of the kids (see tree diagram). The youngest brother is the “proband”, a geneticist’s term for starting point. As determined by whole exome sequencing, the gene responsible is FOXP3, which controls the development of regulatory T cells. These are cells that restrain the rest of the immune system; if they aren’t functioning correctly, the immune system is at war with the rest of the body, like in this family. Supporting the utility of WES [whole exome sequencing] in familial clusters of atypical IBD [inflammatory bowel disease], this approach led to a definitive diagnosis in this case, resulting in a justifiable treatment strategy of allogeneic bone marrow transplantation, the treatment of choice for IPEX [Immune dysregulation, polyendocrinopathy, enteropathy, X-linked syndrome]. Bone marrow transplant is a big deal; doctors are essentially wiping out the immune system then bringing it back, with several associated risks. So the decision to go ahead is not taken lightly. In general, whether bone marrow transplant — either autologous (patient donates back to self) or allogeneic (the donor is someone else) — is appropriate as a treatment for inflammatory bowel disease is still being investigated. Here, since a genetic origin is clear and there are autoimmune effects beyond the digestive system, it becomes the treatment of choice.